I am really please to see the first of the Statues of Liberty to head out the door to there new owners apartment. 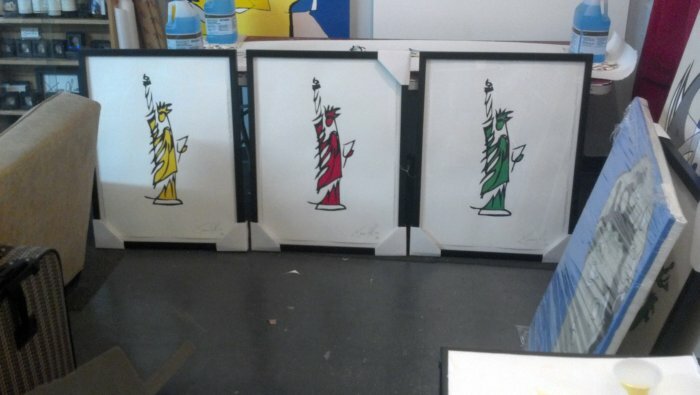 All three are hand signed and numbered 1/50 and will remain together…which is cool. These three are based on three panels of my ‘Art History’ painting. Yellow is Pop Art, the Red is Russian Pop art and the Green is the last panel of the painting and represents…well i guess t represents me. I am currently hanging the current collection of works on paper at John Allans in NYC. It will be the first time (in such a short time of their existence) that all the current works on paper will be shown together. I will keep everyone informed as to when the big party will be…I hope to see you all there. Thank you everyone please feel free to share.